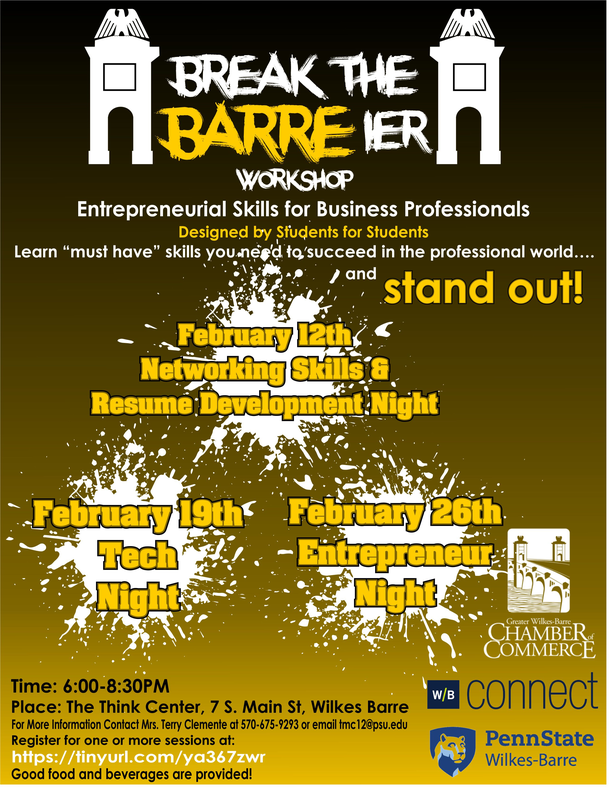 The Greater Wilkes-Barre Chamber and Penn State Wilkes-Barre, through the Wilkes-Barre Connect Program, are proud to present the Wilkes-Barre Connect Student Series: Break the Barre-ier Workshops. 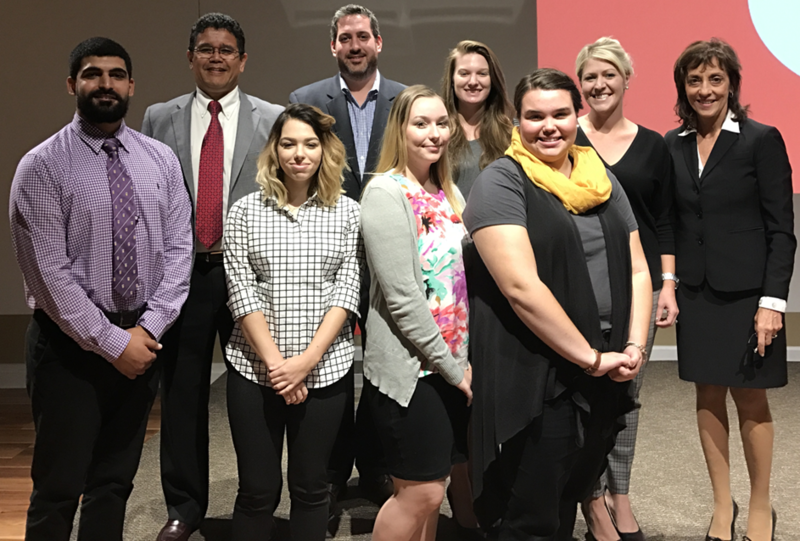 Made possible by the Invent Penn State Initiative, and developed by Penn State Wilkes-Barre students in their BA 321 class, the new series was designed by students for students, teaching beneficial entrepreneurial skills to emerging business professionals. The event series was the result of a class project challenge, which asked students to design an event or program which would link the academic and business community in a beneficial way. 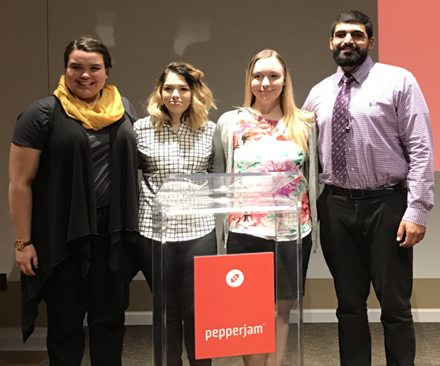 Students pitched their event ideas on the last day of class, and the winning group was able to work with Penn State Wilkes-Barre and the Greater Wilkes-Barre Chamber of Commerce to turn their idea into a reality. With the first three workshops of the series quickly approaching, we spoke to two of the students who designed this series at Penn State Wilkes-Barre, Sara Biller and Taylor Finan, to provide some insight into what the series will hold and how it came to be. A (Sara): When we were designing the event, it was geared more toward students. But, it’s honestly for anyone who wants to brush up on, or learn new professional business skills. Q: Did you feel there was a need not being met which led you to develop this program? A (Taylor): I felt that students were not aware of the many opportunities available in our area. Students seem to want to leave the area as soon as they graduate, but when they leave, they take potential skill with them that could be applied to different industries available. Q: How do you feel students from local colleges and universities can benefit from a program like this? A (Sara): Students will be able to learn skills that will make them stand apart from other students, while getting to know the local businesses around them. A (Taylor): I feel like students can benefit by building on their professional skills and networking with industry leaders in our area. Business leaders can benefit as well…if a manager needs to find a new way to conduct market research via social media, they may find it beneficial to attend these events and introduce themselves to students who have potentially gained this type of training or learning while in school. Q: What would you say is the greatest perk for someone participating in the Break the Barre-ier sessions? A (Sara): I think the greatest perk is being able to network with the local businesses and getting to know the professionals around our area. A (Taylor): I would say that the biggest perk for attending these sessions would be that students can gain real-world experience, and can meet new individuals who could potentially be their next boss or business partner. Q: How was the content developed for the Break the Barre-ier events? A (Taylor): This content was developed through classroom brainstorming and interviews with local small business leaders and owners. Sara and I wanted to create something that was fun and informative for not only students, but business leaders as well. Q: What do you hope participants will gain from taking part in the Break the Barre-ier sessions? A: We hope that students feel more comfortable with themselves in terms of being young professionals ready to take on the business world. We hope that through collaborations with the Greater Wilkes-Barre Chamber and Penn State Wilkes-Barre, everyone feels welcome and will understand that this is meant to help the integration of business and education in the new generation. Q: Tell us about Wilkes-Barre’s THINK Center and why it is a good space for these events. A (Sara): The THINK Center is an amazing space for students to utilize, and there’s so much space to work in groups. Everything you need is in one place. It’s different than being in a library or coffee shop, you really feel inspired being down there. One of the perks of the event is that it gets students and members of local businesses down to the Think Center to see what an amazing space it is,and, hopefully, they will utilize it in the future. Q: Give us some details about what the coming sessions will hold and what attendees can expect. A (Taylor): Students can expect nights full of friends, food, and a whole lot of fun! While these sessions were created for the purpose of student and business leader interaction, we hope that students have fun and will want to come back. On February 12th, we will be introducing different networking skills and resume development insights. We hope that students can start to build their professional side and have the basics ready to hit the ground running in finding their career path. February 19th will be ‘Tech Night,’ and we will be introduced to different programs available to students that will help build their skill set. On February 26th, we will be wrapping up with ‘Entrepreneur Night.’ Students are going to hear from current Penn State students and alumni who have taken their education and have started their own businesses. Feb. 12th: Networking Skills & Resume Development Night - Register here. Feb. 19th: Tech Night - Register here. Feb. 26th: Entrepreneur Night - Register here. Wilkes-Barre Connect is powered by the Wilkes-Barre Chamber of Business & Industry featuring partnerships among the Small Business Development Center at Wilkes University, the Diamond City Partnership, The Institute for Public Policy & Economic Development at Wilkes University, Ben Franklin Technology Partners of NEPA, the Family Business Alliance at Wilkes University, and the Allan P. Kirby Center for Free Enterprise and Entrepreneurship at Wilkes University.